Elena Fabianovna Gnesina (born May 30 [May 18, O.S. ], 1874, Rostov-on-Don – died June 4, 1967, Moscow) was a Soviet pianist, educator, public figure and Honored Artist of the RSFSR (Russian Soviet Federative Socialist Republic), she received numerous state awards. Elena Fabianovna is one of the Gnesin sisters who founded the Gnesin Academy. Amongst Gnesina’s compositions are piano etudes and pieces and works for children. She is the author of Piano ABC (Fortepiannaya Azbuka) and other educational and methodical literature. Elena Fabienovna Gnesina was born in Rostov-on-Don into a family of Fabian Osipovich Gnesin and Bella Isaevna Fletzinger-Gnesina. Elena’s father was a Rabbi and her mother was a singer and pianist who had studied with Stanisław Moniuszko. The eldest daughters Eugenia and Elena, first studied at home in Rostov-on-Don, then went to Moscow to continue their education. Both of them were enrolled at the Moscow Conservatory. The famous composers A. Arensky and S. Taneyev were among their teachers. Later, younger sisters, Elizabeth and Maria, moved to Moscow. The young girls plunged into the capital’s musical life. Elena Gnesina studied with Vasily Safonov at the Moscow Conservatory, graduating with distinction in 1893. After graduation, Elena became a teacher in the Arsenyev Gymnasium. She was very keen on teaching, just then she had an idea to establish her own school. Elena shared this idea with her older sister Eugenia and the sisters decided to establish music school. They were supported by teachers from the conservatory, who helped in obtaining an official permit for the school establishment. 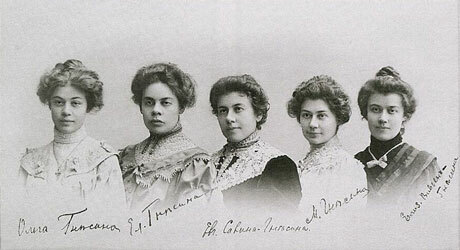 When their sister Maria graduated from the conservatory, she immediately joined Elena and Eugenia. In 1895 they established a private music school in Moscow. First, the teaching staff consisted of only three Gnesin sisters. In 1901, after graduating from the conservatory, the fourth sister Elizabeth joined them. The newly established music school attracted more and more students. The sisters began to invite talented musicians to work in the school, among them were R. Glier, E. Kolobova, A. Grechaninov, E. Beckman-Shcherbina. The younger sister Olga also joined the teaching staff. In 1925, Elena Gnesina received the title of Honored Artist, in the same year the music school became the Gnesin State Musical College, which Elena Fabianovna herself ably directed. In 1936 the teaching staff joined another representative of the family, their younger brother, a composer Mikhail Fabianovich Gnesin. In 1944 the Gnesin State Musical College became the Gnesin Institute and Mikhail Gnesin became its director. The Gnesins were among the best educators and musicians of the 20th century. 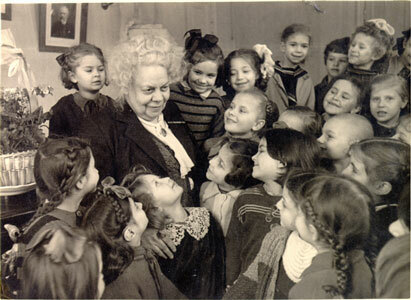 Undoubtedly, the most important role was played by Elena Fabianovna, who, as a beginning teacher, had a great desire to create her own educational institution. 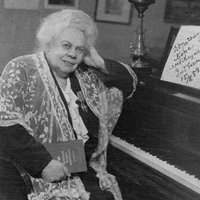 Elena Gnesina is the author of Piano ABC (Fortepiannaya Azbuka) and other educational and methodical literature, more than one generation of musicians studied on her teaching aids. Elena Fabianovna Gnesina died in Moscow on 4 June 1967 and is buried in the Novodevichy Cemetery.